The United Nations recently hailed spirulina powder as “the best food for the future”, high praise indeed! This Spirulina powder is certified organic and guaranteed contaminant free made from blue-green, freshwater algae. It is suitable for a vegan diet and has been dried at low temperatures with nothing added or taken away. Spirulina powder has only become such a sought-after addition to the Western diet in recent years, meaning that many of our customers are still highly unfamiliar with this nutrient-dense and rather striking food supplement. Sometimes sold in capsule form, it is made from a special type of unicellular freshwater blue-green algae that was once a valuable source of food and medicine for the Aztecs and Mesoamericans. Today, spirulina algae is cultivated in lakes and pools all over the world, where it especially thrives at a pH of around 8.5 and a temperature of approximately 30 °C. Thanks to its high nutritional content, NASA and the European Space Agency both proposed that spirulina be cultivated as a primary source of food during long-term space missions. 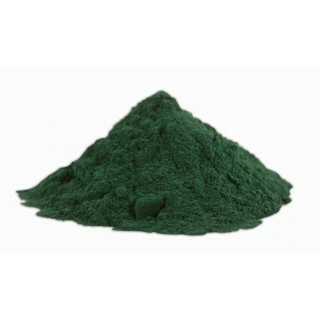 Those considering the purchase of spirulina powder for the very first time, quite rightly want to know more about its plethora of purported benefits. These much prized benefits have been enjoyed for thousands of years by the Aztecs for example, who referred to spirulina as ‘tecuitlatl’ and supplied it to their athletes and warriors for added strength and endurance. It contains an abundance of valuable nutrients, including protein (it’s actually considered a complete source of protein, making it a favourite with vegetarians). Possesses fibre and chlorophyll (the natural plant pigment that’s responsible for its striking colour and allows plants to absorb energy from light). 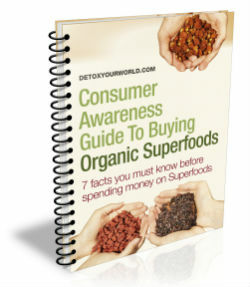 It is also has calcium, vitamins (vitamins B12 and K) and minerals (such as magnesium, potassium, thiamine, riboflavin, niacin, iron, copper and manganese). Spirulina Powder is perfect in smoothies, shakes, juices and protein drinks, or as an additional ingredient in rawfood recipes. Simply place all of the above ingredients into your blender, blitz until smooth and creamy, pour into a glass, and enjoy! 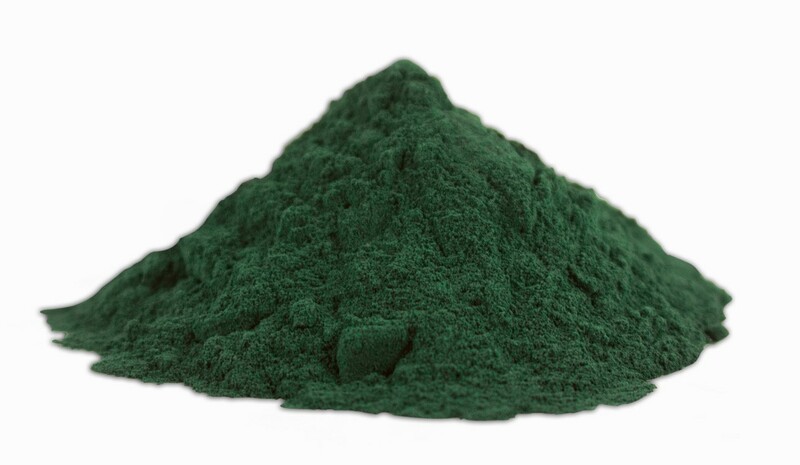 Spirulina Powder is rich in calcium. The calcium in spirulina powder contributes to normal blood clotting, a normal energy-yielding metabolism, normal muscle function and normal neurotransmission. It also contributes to the normal function of digestive enzymes and has a role in the process of cell division and specialisation. In addition, calcium is needed for the maintenance of normal bones and normal teeth, as well as the normal growth and development of bone in children. 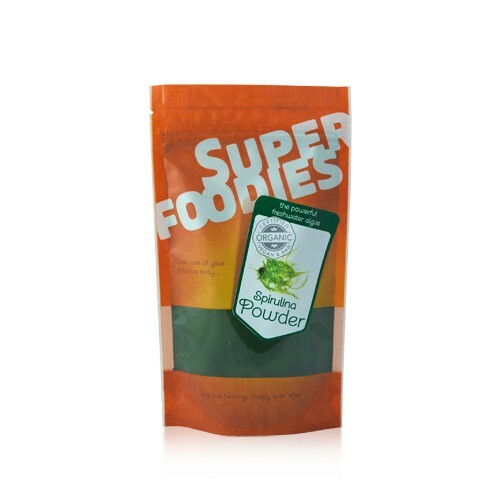 This is the same nutrient dense Spirulina powder that Detox Your World has been caringly providing you for over 10 years but just now in a beautiful new Superfoodies bag! With the attention to detail and research that goes into sourcing our products, you can trust this Spirulina powder is and always will be certified organic and only of the highest quality. Gluten-free. Not suitable for those with an allergy to iodine, algae, chlorella or spirulina. Always read the product information supplied, before deciding to consume spirulina powder. Packaged in an area where nuts are processed. A beautiful deep green in colour, it took me a while to get used to the taste. I started with a quarter of a teaspooon and I've worken up to 1 level tsp now. I mix it with pineapple juice and it tastes great. I think the key is to build up your quantity.